4By identifying which zone applies to you, you can select the correct product to help you treat your specific problem area. If so, you're not alone, most of us will encounter neck pain at some stage in our lives. Usually nothing serious, this will often be due to poor posture or the strains caused by lifestyle. Your head places around 12Ibs of pressure on your neck when it is in a good position and considerably more when we are looking at our computers, tablets or smortphones. Our neck brace has been designed tc literally give your neck a rest, while providing discreet support, and with all the support of a traditional neck brace. The bac< Neck Brace is available in a range of colours. Many of us will suffer from shoulder pain at some point In our lives, and of those that do, half are likely to have on-golng symptoms. Due to lifestyle factors our shoulders can gradualy become more hunched and rounded, generating bad posture and pain. The boc< Dual Action Roller Massager has been designed to help relieve aches and pains in the neck, shoulders and back. it can be used both dry or with relief gel. and allows you to reach all areas of your back with ease. Additionally, the bac< Shoulder Brace has been designed to help improve your posture, prevent slouching and support your spine. Do you suffer from middle back pain? Back pain effects nearly all of us at some point in our lives, whether it is from an injury, age or a medical condition. Throughout the day we put our back through a great deal; bending, twisting, lifting and carrying. Even how we sit and stand also has an impoct. Doing all of these in a poor posture can cause injury, stress on our joints, and incur pain. Here at bac< our Shoulders Brace has been specifically designed to help support the middle of your back and shoulders, helping to keep you in a posture friendly position. It can be used for both poor posture prevention and posture improvement. Do you suffer from central lower back pain? With todays more sedentary modern lifestyles many of us don't hove enough muscle tone to support our spine, causing poor posture and injuries, lending to aches and pains. The bac< Bock Brace has been designed specifically to give your back the support it needs, whilst providing additional pain relief with the included Cool Pads. Do you suffer from lateral lower back pain? Most adults will suffer from lower back pain at some point in their life. For some of us this is short term, however many of us have persistent pain lasting beyond 12 weeks. The lowest point of your back is what supports the entire weight of your upper body, which can place a lot of stress on this area. Pain can be felt in your lower back, hip, buttocks or even down your legs. The bac< Sacroiliac Belt has been developed to help support the joints in the lowest area of your back and hips, preventing excess movement and reducing pain. After a period of using the Back Brace, there are simple exercises you can do to strengthen your back, restore normal muscle function, and help prevent further pain. These are available on our website via the homepage. 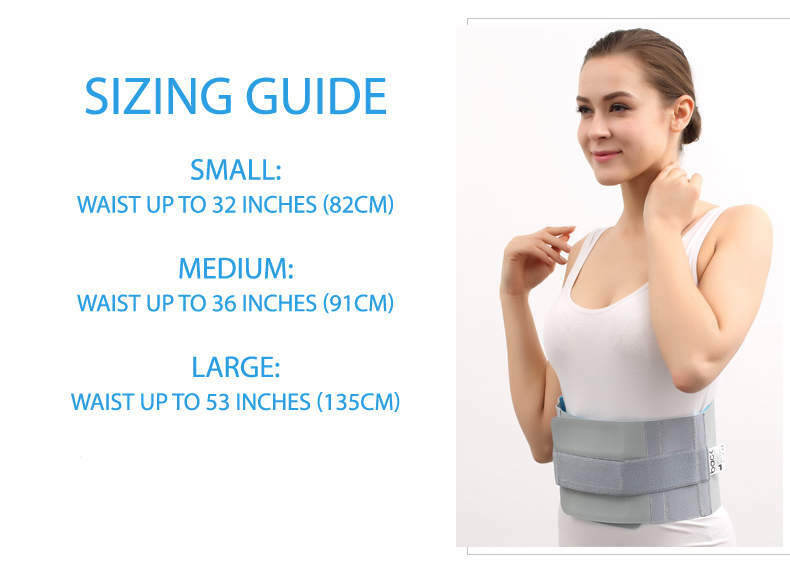 How long can I wear the Back Brace for? Can I wear the Back Brace while I sleep? 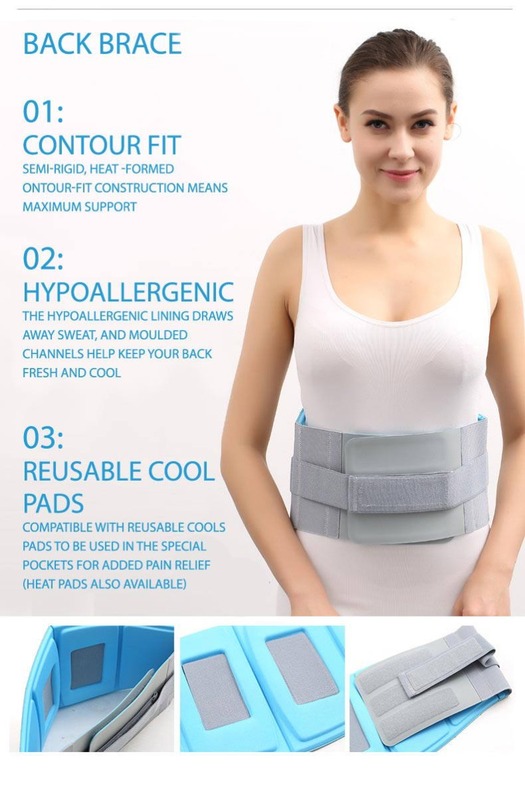 Is it better to use the Back Brace with the Heat Pads or Cool Pads? Both hot and cold pads promote blood flow to the applied area helping to reduce swelling and ease aches and pains. It's personal preference in which to use (we like to alternate) and is a brilliant, safe form of therapy in relieving pain and aiding recovery. How do I wash the Back Brace? This means that in the unlikely event you are not completely satisfied with your purchase, you can return your order to us for a refund within 30 days of receipt. To return an item to us, simply use the address label and returns form provided. The returns form must be completed for both refunds and exchanges, and must be included in your returned package. You can then send your item back to us via your chosen post office or courier. Please note that all return postage costs are paid for by the customer. If you have requested an exchange, your replacement item will be dispatched to you free of charge. We recommend that you keep your proof of postage until your refund or exchange has been processed. All our items are now fulfilled and dispatched by Amazon, allowing us to deliver products to you more efficiently. This doesn’t change how you order from us, but it does mean we can now offer you standard delivery from just £2.99*!